Engine: Engine and radiator checks are straightforward, and should include an examination of all belts and hoses, as well as the crane’s exhaust system. Hydraulics: Be alert for any signs of oil leaks from the winch motors and the hydraulic lines that feed them. Boom: Closely look over both the main boom and the jib. Be especially alert for any signs of stressed metal, cracks along weld lines, or signs of impact damage. Boom Interior: Look inside the retractable boom sections and confirm that all wear pads are in good condition. Hook: Examine the hook block to make sure it’s in good condition. Also examine the sheaves in the block structure. They should be free of wear with no broken or jagged edges present and should move freely. Boom Cylinder: Check the pin assemblies and the boom cylinders for cracks and other signs of stress, unusual wear or damage. 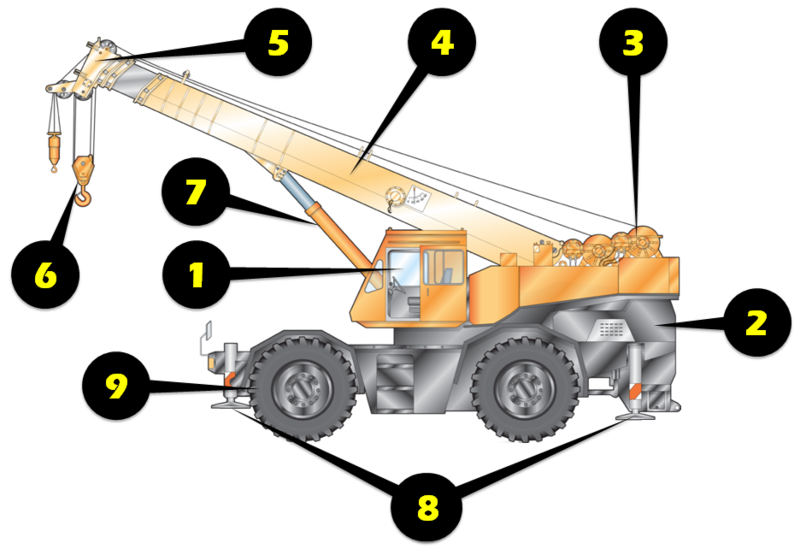 Have your operator raise and lower the boom a few times so that you can examine all movement here and note any problems. Note excessive rust on the boom and jib structures. Outriggers: Check all four outriggers and make sure no hydraulic leaks are present, the footpads are okay, and no stress damage has been inflicted. WARNING: Do not operate any crane unless you know how. These machines can tip over if operated improperly. Also, always check for overhead electrical lines prior to inspection.